Technicians from AkzoNobel and a group of students from the Netherlands unveiled Nuna7, the race car that will be entering into this year’s World Solar Challenge. The Nuna7 solar-powered vehicle, which features pioneering pore-filling technology, will take part in the competition in Australia in October. It will be the first time that Nuna has used the new composite pinhole filler Aerowave 2501, which has already been used on commercial aircraft. “When the carbon fiber shell of the Nuna is manufactured, the process creates pinholes that must be filled with putty and then sanded, often multiple times,” explained John Grevers, AkzoNobel’s Technical Coordinator for Benelux and Sikkens project leader for the Nuna. As well as the new pinhole filler, the Nuna 7 also features an aerodynamically advanced Sikkens coatings system designed to reduce wind drag and cut down on preparation time. Products used include Colorbuild Plus, Autocryl Plus LV, and Autoclear LV Superior. This is the fourth time that the Nuon Solar Team from the Technical University in Delft and Sikkens paint experts from the AkzoNobel’s Automotive and Aerospace Coatings business have worked together. 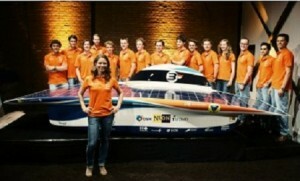 The team hopes to go one better than 2011, when the Nuna 6 finished second in the 11th World Solar Challenge. The biennial event, which aims to promote research on solar-powered cars, will be staged from October 6-13.